West Brom sealed their place in the last 16 of the FA Cup with a comfortable win over 10-man Newcastle. Jonas Olsson headed in Chris Brunt's corner before Graham Dorrans scored from the spot after Tamas Kadar was adjudged to have fouled Roman Bednar. Andy Carroll's volley gave the visitors hope before Ryan Taylor saw red for a challenge on Jerome Thomas in the box. Dorrans converted the penalty and Thomas tapped in a fourth, with Carroll firing home a late consolation. It was a home win that rarely looked in doubt, even before the Magpies' hopes were effectively ended by Taylor's red card and the subsequent penalty from Dorrans. Fair enough, we can now concentrate on the league - but this defeat will smash the squad's morale. The two clubs battling for promotion back to the Premier League had drawn both their league meetings this season, most recently a 2-2 draw at St James' Park on Monday. But the managers' respective approach to this game was very different, with Baggies boss Robert Di Matteo naming an unchanged line-up while Newcastle's Chris Hughton replaced five players. The home side's greater fluidity was clear from the start and they took a deserved lead when Olsson, who opened the scoring in the sides' previous meeting six days ago, repeated the trick on 17 minutes. Brunt whipped in a corner and the Swedish defender was allowed a free header that crawled over the line despite the despairing efforts of Jose Enrique to clear it. With the visitors looking disjointed, West Brom's dominance continued and they soon doubled their lead, albeit in controversial circumstances. The Magpies' Hungarian centre-back Kadar was involved in a seemingly innocuous tangle with Bednar just inside the 18-yard box, but the referee's assistant flagged for a penalty, much to the dismay of the Newcastle defenders. Dorrans showed little sympathy with an emphatic finish from the penalty spot that was too good for Tim Krul, who had dived the right way. Hughton brought on Shola Ameobi at half-time and the forward had Newcastle's first meaningful chance, seeing his shot well parried by Scott Carson. His strike-partner Carroll then dragged his side back into the game. Jonas Gutierrez broke down the left and cut the ball back for Carroll to hammer an unstoppable volley past Carson. The Magpies looked rejuvenated but just as they began to push for an equaliser, their hopes of a comeback were swiftly ended. Ameobi was denied a penalty after being sandwiched between two defenders and the ball was hoofed straight upfield, where Taylor hauled down Thomas in the box. Referee James Linnington sent Taylor to the stands and Dorrans calmly tucked away his second spot-kick of the game, despite keeper Krul again diving the right way. Minutes later, Thomas capitalised on the uncertainty in the visitors' back line and tapped home a fourth goal from inside the six-yard box. There was still time for Carroll to notch his second of the game, twisting and turning before firing past Carson in injury time - but it was not enough to preserve the Magpies' 14-game unbeaten run. "The first goal, I can't for the life of me see how a linesman can rule that over the line. "The first penalty was soft - if the referee gives that he has to give the two for (fouls on) Taylor and Ameobi. "For the sending off, we are led to believe he was going to give a yellow card and changed his mind to a red one - I think that is incredibly harsh." "If you are on the losing side, people might start staying 'referee this and referee that'. "The referee has a hard job, it is easy to look back and say 'he should have done this or that'. "He has got to make split-second decisions and he's seen it as he has seen it - it has gone for us and not for them. It happens." 90:00+4:52 Centre by Ryan Donaldson, Andrew Carroll takes a shot. Save made by Scott Carson. 90:00+2:27 Graham Dorrans takes a outswinging corner to the near post, Kevin Nolan manages to make a clearance. Shot by Gabriel Tamas went over the crossbar. 90:00+1:46 Marek Cech produces a strike on goal direct from the free kick, Alan Smith gets a block in. 90:00+1:46 Booking Sanchez Jose Enrique is cautioned. 90:00+1:26 Sanchez Jose Enrique challenges Ishmael Miller unfairly and gives away a free kick. 90:00+0:38 GOAL - Andrew Carroll:West Brom 4 - 2 Newcastle Goal scored by Andrew Carroll from the edge of the area to the bottom left corner of the goal. West Brom 4-2 Newcastle. 90:00+0:05 Andrew Carroll takes a shot. Blocked by Gonzalo Jara. Inswinging corner taken from the right by-line by Jonas Gutierrez. 88:36 Graham Dorrans challenges Jonas Gutierrez unfairly and gives away a free kick. Free kick taken by Fabricio Coloccini. 87:07 Jonas Olsson takes the free kick. 87:07 Booking Alan Smith is given a yellow card. 86:52 Foul by Alan Smith on Youssouf Mulumbu, free kick awarded. 85:57 The offside flag is raised against Ishmael Miller. Fabricio Coloccini takes the indirect free kick. 84:47 Effort from 18 yards by Ishmael Miller. Save by Tim Krul. Graham Dorrans takes a inswinging corner to the near post, Header from close range by Marek Cech clears the bar. 80:41 Substitution Ryan Donaldson is brought on as a substitute for Danny Guthrie. 80:23 Foul by Nile Ranger on Joe Mattock, free kick awarded. Joe Mattock takes the free kick. 79:41 Shot on goal by Gabriel Tamas from long range goes harmlessly over the target. Correction - 78:51 Substitution Nile Ranger joins the action as a substitute, replacing Shola Ameobi. Correction - 78:51 The ball is delivered by Gianni Zuiverloon, save made by Tim Krul. 78:51 Graham Dorrans takes a inswinging corner. 78:51 Substitution Andrew Carroll goes off and Nile Ranger comes on. 78:51 Gianni Zuiverloon crosses the ball, save by Tim Krul. 77:54 Booking Tim Krul is shown a yellow card. 76:29 Substitution Joe Mattock joins the action as a substitute, replacing Jerome Thomas. 76:29 Substitution Roman Bednar leaves the field to be replaced by Ishmael Miller. 75:50 GOAL - Jerome Thomas:West Brom 4 - 1 Newcastle Jerome Thomas finds the net with a goal from inside the six-yard box to the bottom left corner of the goal. West Brom 4-1 Newcastle. 71:30 GOAL - Graham Dorrans:West Brom 3 - 1 Newcastle Graham Dorrans scores a power penalty. West Brom 3-1 Newcastle. 70:52 Sent off The referee red cards Ryan Taylor for professional foul. 68:05 Penalty awarded for an unfair challenge on Jerome Thomas by Ryan Taylor. 66:37 Substitution Gianni Zuiverloon is brought on as a substitute for Chris Brunt. 66:02 Danny Guthrie takes the inswinging corner, Centre by Sanchez Jose Enrique. 64:03 Ryan Taylor sends in a cross. 62:51 Centre by Ryan Taylor, Graham Dorrans gets a block in. Outswinging corner taken right-footed by Danny Guthrie from the right by-line, clearance made by Jonas Olsson. 61:28 Assist by Jonas Gutierrez. 61:28 GOAL - Andrew Carroll:West Brom 2 - 1 Newcastle Goal scored by Andrew Carroll from the edge of the area to the top right corner of the goal. West Brom 2-1 Newcastle. 59:53 Jonas Gutierrez produces a cross, clearance made by Gabriel Tamas. 59:30 Jonas Gutierrez delivers the ball, Gabriel Tamas makes a clearance. Correction - 58:45 Graham Dorrans gives away a free kick for an unfair challenge on Sanchez Jose Enrique. Tamas Kadar restarts play with the free kick. 58:45 Graham Dorrans concedes a free kick for a foul on Sanchez Jose Enrique. Alan Smith takes the free kick. 57:56 Roman Bednar is caught offside. Indirect free kick taken by Tim Krul. 55:57 Graham Dorrans challenges Andrew Carroll unfairly and gives away a free kick. The free kick is swung in right-footed by Ryan Taylor, Gonzalo Jara makes a clearance. 55:10 Free kick awarded for an unfair challenge on Fabricio Coloccini by Jerome Thomas. Tim Krul takes the direct free kick. 54:33 Foul by Shola Ameobi on Youssouf Mulumbu, free kick awarded. Free kick taken by Gabriel Tamas. 54:01 Youssouf Mulumbu concedes a free kick for a foul on Danny Guthrie. Fabricio Coloccini takes the direct free kick. 53:25 Corner taken right-footed by Graham Dorrans, clearance made by Kevin Nolan. 52:48 Robert Koren crosses the ball. 52:08 Shola Ameobi takes a shot. Save by Scott Carson. 48:03 Danny Guthrie takes a shot. Jonas Olsson gets a block in. 47:47 Jerome Thomas crosses the ball, clearance made by Kevin Nolan. 46:49 The assistant referee flags for offside against Roman Bednar. Indirect free kick taken by Tamas Kadar. 46:09 A cross is delivered by Andrew Carroll, Gonzalo Jara makes a clearance. 45:01 Substitution Fabrice Pancrate goes off and Shola Ameobi comes on. 45:00+2:38 The ref blows to end the first period. 45:00+0:37 Free kick awarded for a foul by Alan Smith on Gabriel Tamas. Scott Carson takes the free kick. 45:00+0:07 Shot by Danny Guthrie. Jonas Olsson gets a block in. Danny Guthrie takes the inswinging corner, clearance by Gonzalo Jara. Correction - 41:19 Chris Brunt produces a left-footed shot from just outside the area that goes harmlessly over the target. 41:19 Shot by Chris Brunt from just outside the area goes over the net. 40:25 The ball is delivered by Sanchez Jose Enrique. 40:06 Marek Cech produces a cross, save by Tim Krul. 37:59 Shot by Chris Brunt. Save made by Tim Krul. 37:47 The ball is crossed by Graham Dorrans. 37:26 Free kick awarded for a foul by Fabrice Pancrate on Jerome Thomas. Graham Dorrans takes the free kick. 34:33 Unfair challenge on Jonas Gutierrez by Chris Brunt results in a free kick. Sanchez Jose Enrique restarts play with the free kick. 33:23 Free kick awarded for an unfair challenge on Marek Cech by Fabricio Coloccini. Youssouf Mulumbu takes the direct free kick. 32:28 Free kick awarded for a foul by Jerome Thomas on Fabrice Pancrate. Tim Krul restarts play with the free kick. 31:33 Free kick awarded for an unfair challenge on Jerome Thomas by Alan Smith. Free kick taken by Marek Cech. 30:36 GOAL - Graham Dorrans:West Brom 2 - 0 Newcastle Graham Dorrans scores a power penalty. West Brom 2-0 Newcastle. 29:42 Booking The referee shows Tamas Kadar a yellow card for unsporting behaviour. 28:40 Roman Bednar fouled by Tamas Kadar, the ref awards a Penalty. 28:21 Ryan Taylor sends in a cross, Jonas Olsson manages to make a clearance. Correction - 27:33 Jerome Thomas is caught offside. Free kick taken by Fabricio Coloccini. 27:33 The official flags Jerome Thomas offside. Fabricio Coloccini takes the indirect free kick. 26:20 Graham Dorrans has an effort at goal from outside the area which goes wide right of the goal. 24:58 Free kick awarded for a foul by Roman Bednar on Sanchez Jose Enrique. Alan Smith restarts play with the free kick. 24:18 Robert Koren gives away a free kick for an unfair challenge on Sanchez Jose Enrique. Alan Smith takes the direct free kick. 21:42 The official flags Kevin Nolan offside. Scott Carson takes the free kick. 21:10 Roman Bednar gives away a free kick for an unfair challenge on Tamas Kadar. Fabricio Coloccini takes the free kick. Correction - 20:30 Effort by Kevin Nolan from a long way out goes over the target. 20:30 Kevin Nolan takes a long range shot clearing the crossbar. 18:55 Centre by Robert Koren, Tamas Kadar makes a clearance. 16:27 Assist by Chris Brunt. 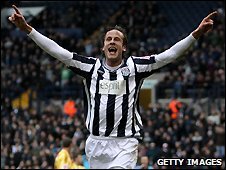 16:27 GOAL - Jonas Olsson:West Brom 1 - 0 Newcastle Jonas Olsson scores a headed goal from deep inside the penalty area. West Brom 1-0 Newcastle. 15:11 A cross is delivered by Chris Brunt, clearance by Tamas Kadar. 14:14 A cross is delivered by Jonas Gutierrez, Header from deep inside the penalty area by Andrew Carroll goes harmlessly over the crossbar. 13:39 Fabrice Pancrate gives away a free kick for an unfair challenge on Youssouf Mulumbu. Direct free kick taken by Jonas Olsson. 12:08 Roman Bednar produces a right-footed shot from inside the area that clears the crossbar. 11:07 The ball is swung over by Marek Cech, save by Tim Krul. 10:50 Free kick awarded for a foul by Andrew Carroll on Gabriel Tamas. Gabriel Tamas takes the free kick. 10:19 Long distance shot from Robert Koren misses to the left of the net. 9:29 Drilled left-footed shot by Graham Dorrans. Blocked by Fabricio Coloccini. Gabriel Tamas has a drilled shot. Save made by Tim Krul. 8:52 Chris Brunt crosses the ball, clearance by Ryan Taylor. Corner taken right-footed by Graham Dorrans from the left by-line, clearance by Andrew Carroll. 8:19 Ryan Taylor delivers the ball, save made by Scott Carson. 8:12 A cross is delivered by Kevin Nolan, clearance made by Jonas Olsson. 7:36 The ball is sent over by Jonas Gutierrez. 6:50 Roman Bednar is ruled offside. Tamas Kadar takes the free kick. 4:22 The ball is crossed by Graham Dorrans, clearance by Tamas Kadar. 3:39 Andrew Carroll crosses the ball, Jonas Gutierrez produces a right-footed shot from just outside the penalty area that goes harmlessly over the target. 3:11 Jonas Gutierrez fouled by Chris Brunt, the ref awards a free kick. Free kick taken by Sanchez Jose Enrique. 0:46 Graham Dorrans sends in a cross, save made by Tim Krul.